This is Musical Brick and we love music and Lego bricks. So here we list 10 songs that mention Lego in the lyrics. 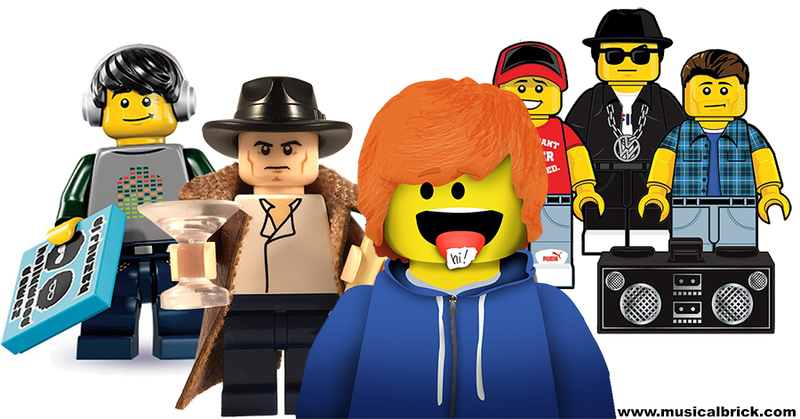 This list is not exhaustive, as there are many more artists using Lego in their lyrics. We have included artists such as XTC, The Housemartins, Marillion, Beastie Boys, Black Eyed Peas, and Ed Sheeran. How she’s different is anyone’s guess. Love them! Bought 2 different designs and they arrived quickly! Awesome item! Exactly as shown. Packed well. Recipient was thrilled! So amazing! My boyfriend said that this has been the most fun he's ever had with a present! (Genesis The Lamb Lies Down On Broadway Stage Set) I honestly don't think that my review gives justice to the awesomeness that is "Musicalbrick"! I purchased several items for Christmas presents.... it was a VERY merry Christmas! Excellent product and customer service! These mini figures are sooo awesome!!! GENESIS is my favorite band, I’m glad they are getting some recognition. I’ve bought two already, just ordered eight more. Hope that we can get the Mike, Tony and Steve mini figures soon. Maybe one day a mini figure for Chris Stewart, John Silver, John Mayhew and Anthony Phillips will be available to have the whole group. Again they are GREAT!!!! THANK YOU!!! 10 Reasons Why Supper’s Ready is the Greatest Song Ever! Book celebrating this landmark album by Genesis. The legendary book, served as an interactive App. Leading UK Genesis Tribute band.